Fresh from the breakup of the San Francisco-based pop band The Nerves, whose song "Hanging on the Telephone" would later become a hit by Blondie in 1978, singer/songwriter Peter Case drifted south to Los Angeles and its region's burgeoning D.I.Y. music scene. Case formed The Plimsouls, named after the British term for "sneakers," in 1979 with LA musicians, drummer Lou Ramirez and bassist Dave Pahoa. After the addition of Austin guitarist Eddie Munoz, the quartet gigged heavily throughout Southern California, honing their style of rock ’n' roll, a mixture of 1960s rock and soul, 1950s R&B and punk zeal. Subsequently, the band caught the ear of a number of local writers and DJs, namely Chris Morris, music scribe for LA Reader, and KROQ-Los Angeles' Rodney Bingenheimer. Even though the band's self-titled release in 1981 was its full-length debut, The Plimsouls was already a tight and confident unit brimming with vitality, led by Case's young Lennon-esque snarl. Now available for the first time, Live! Beg, Borrow & Steal captures a festive 1981 Halloween show, excellently recorded by Jeff Eyrich and Steve Hunter, with a young, talented band doing what it did best. And The Plimsouls rocked for their hometown fans at the legendary Whisky A Go Go. The Plimsouls' admiration for ’60s garage, both in the US and in the UK, is evidenced in the roaring renditions of The Easybeats' "Sorry," The Kinks' "Come On Now" and The Midnighters' "Jump, Jive & Harmonize." With assistance from members of The Fleshtones, the band dives into spirited versions of Little Richard's "Hey! Hey! Hey! Hey!" and Gary U.S. Bonds' "New Orleans." The Plimsouls had already incorporated a considerable amount of newer material in the set list, such as "Shaky City," "Inch by Inch," and "A Million Miles Away." They would eventually release "A Million Miles Away" independently as a 12" single (after a dispute with then-label Planet Records), which became the band's most "successful" song (thanks to the inclusion of the song in Martha Coolidge's indie film, Valley Girl). Mind you, this was a time when Kim Carnes, Rick Springfield and Air Supply ruled the charts and dominated radio airplay. On Live! Beg, Borrow & Steal, The Plimsouls give the song both muscle and sparkle, with the solid rhythm section augmenting Munoz's often underrated guitar work, which, on this evening, is remarkable. 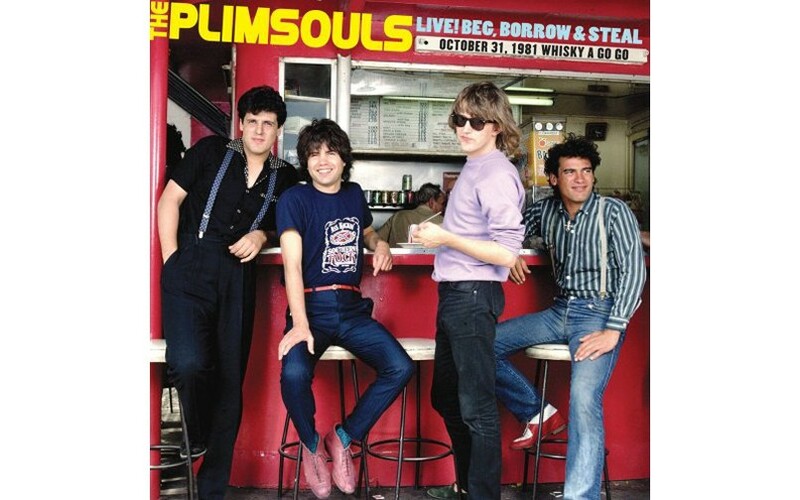 The Plimsouls disbanded not long after their superb sophomore effort, Everywhere At Once, released in 1983 on Geffen. During the band's meteor-like existence, The Plimsouls was a great rock ’n' roll band, one that often played in sweaty, intimate venues with an electric fury and soulful conviction. You see this on Live! Beg, Borrow & Steal as The Plimsouls tear the roof off.